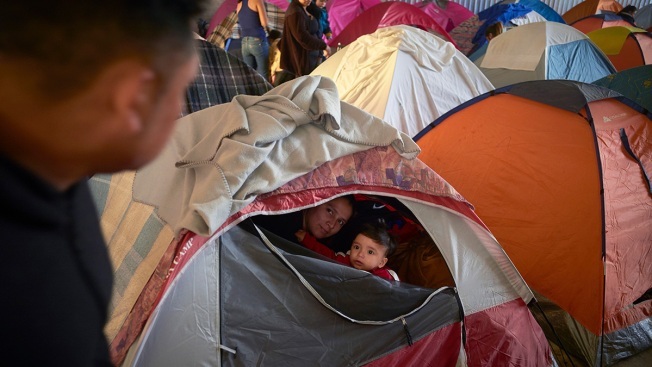 In this March 5, 2019, image, Ruth Aracely Monroy, center, looks out of the family's tent alongside her 10-month-old son, Joshua, as her husband, Juan Carlos Perla, left, passes inside a shelter for migrants in Tijuana, Mexico. After fleeing violence in El Salvador and requesting asylum in the United States, the family was returned to Tijuana to await their hearing in San Diego. They were one of the first families to contend with a new policy that makes asylum seekers stay in Mexico while their cases wind through U.S. immigration courts. Several asylum seekers who are being forced to wait in Mexico while their cases wind through U.S. immigration court told a judge Tuesday that they are afraid to return to Mexico as they await their next hearing — a development that introduces a new wrinkle to a major U.S. policy shift. The seven cases being heard in a downtown San Diego courtroom are among the first to advance under the Trump administration policy that calls for people seeking asylum in the U.S. to be held in Mexico. The initial appearances came three days before a federal judge in San Francisco is set to hear arguments by advocacy groups to halt the policy. Attorney Robyn Barnard asked for access — at least by telephone — to any interviews conducted with her Honduran client with U.S. officials about whether his fears of returning to Mexico are well-founded. 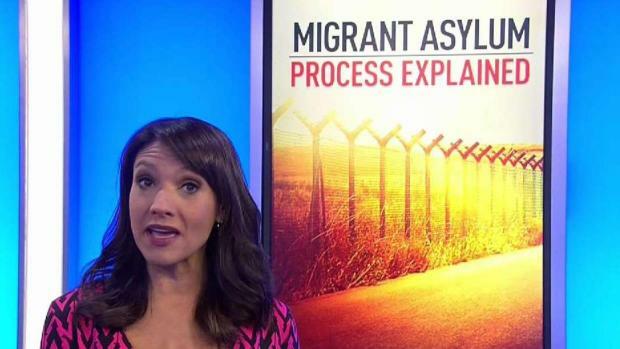 How exactly does the process of asylum work for migrants hoping to come into the U.S.? NBC 7's Catherine Garcia has the answers in this week's San Diego Explained. Jason Aguilar, an attorney for U.S. Immigration and Customs Enforcement, didn't object but deferred the request to other agencies within the Department of Homeland Security. Customs and Border Protection said it wouldn't comment due to pending litigation, and Citizenship and Immigration Services had no immediate comment. The developments raised more questions about the administration's new approach to handling the claims of people who say they fear returning to their homelands because of danger related to race, religion, political beliefs, nationality or membership in particular social groups. The administration hopes that making asylum seekers wait in Mexico will discourage weak claims and help reduce an immigration court backlog of more than 800,000 cases. Currently, families are typically released in the U.S. with notices to appear in court and can stay until their cases are resolved, which can take years. 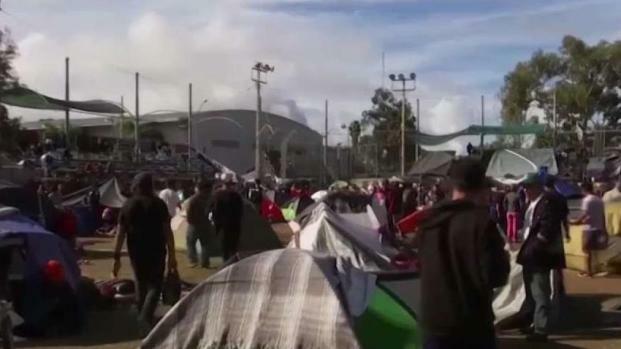 Critics say asylum seekers are forced to wait in unsafe environments and will struggle to find legal advice while in Mexico. Tijuana had more than 2,500 homicides last year. The policy shift was introduced as families from Guatemala, Honduras and El Salvador arrive at the U.S. border to seek asylum. Five of the seven people who were scheduled to appear Tuesday were represented by attorneys. Six were Honduran; one was Guatemalan. Gerson Alonzo Beltrand of Honduras, who had Barnard speak on his behalf, expressed fear of returning to Tijuana, but the government attorney's response left unclear whether Homeland Security would grant his request. A judge scheduled an Aug. 6 hearing on the merits of his asylum claim. "Sir, we made significant progress in your case this afternoon," Rico Bartolomei, chief immigration judge in San Diego, told him. The Associated Press witnessed one of the seven cases in the small courtroom before security guards cleared the aisles of an overflow crowd. Lisa Knox, an attorney for two Honduran men, was in the courtroom and said three asylum seekers had expressed fear of returning to Mexico. Knox said the judge continued her cases to early May to give her more time to prepare. One man failed to appear because he was in U.S. custody in another part of the country. The Trump administration is working on major changes to immigration laws. NBC 7's Ramon Galindo has more on planned peaceful protests around the border. The policy change, which followed months of high-level talks with Mexico, has been introduced slowly with an average of 40 people a week being returned to Tijuana from San Diego in the first six weeks. Mexico agreed to accept up to 120 a week. U.S. officials began returning people to Mexicali, Mexico, from Calexico, California, last week and say they intend to sharply expand such activity across the entire border. Mexicans and children traveling alone are exempt from the policy. U.S. and Mexican officials characterize the policy change as a unilateral move by the Trump administration. Mexico has said it will allow asylum seekers to wait in Mexico for humanitarian reasons. AP photographer Gregory Bull contributed.